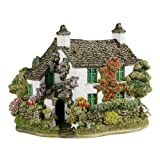 The makers of the world famous Lilliput Lane cottage figurines started their business on the fringe of the Lake District near Penrith and are still based not far away, to the north of Carlisle in the Scottish borders. 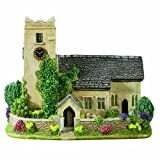 After more than thirty years they are still producing their beautiful handmade and hand-painted miniature models of real cottages, castles and more. 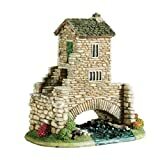 On this page we show the currently available models of buildings in the Lake District. 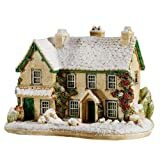 The first is a Winter-view model of Hilltop, the home that Beatrix Potter bought in the Lake District and where she wrote and drew for her many children’s books. Today it is cared for by the National Trust. More Beatrix Potter gifts. Next there are two lovely models relating to the great 19th century poet laureate William Wordsworth, certainly one of Lakeland’s greatest sons. The first is of Dove Cottage just outside Grasmere village on the road toward Ambleside, and a magnet for Lake District visitors from all over the world. The second is the Grasmere church where he and members of his family are buried. Finally here’s one of the “smallest house”, also now a National Trust property, in Ambleside, just one of the many interesting buildings to look out for when you visit the Lakes.